You may have heard that yesterday President Trump finally decided to “end” the Obama-era DACA program protecting the children of illegal immigrants. You probably also know that a lot of people are upset about it, including Barack Obama himself. My position on the issue itself is pretty nuanced. In principle, I am against illegal immigration and living in Southern California I see every day the negative impacts that it can have on our society. On the other hand, my family is full of teachers who work in schools filled with the children of illegal immigrants, so I can see the human side of the subject as well. I am also a realist and, to me, the topic of illegal immigration is one which, contrary to what Trump’s shocking election win might indicate, has already been lost by conservatives. Once Proposition 187 was revoked by the liberal courts here in California in the late 1990s, it was inevitable that we would become a country which provided a huge incentive for people to come here illegally. Ironically, Trump’s presidency is, counterintuitively, further proof of how this is largely, much like abortion, an issue which has been decided in the liberal direction. After all, Trump got the Republican nomination primarily because of his strong rhetoric (lies) on the issue, and yet there has been no movement at all on his famous wall, nor any sign at all of the massive deportation forces he promised during the campaign. The reality is that Trump just used this issue to dupe the GOP base into thinking that he was the toughest guy in the race on the border. Instead, he was just the only one free enough to say things that everyone (including probably Trump himself) presumed would mean you could never win a general election. He doesn’t actually believe any of it. 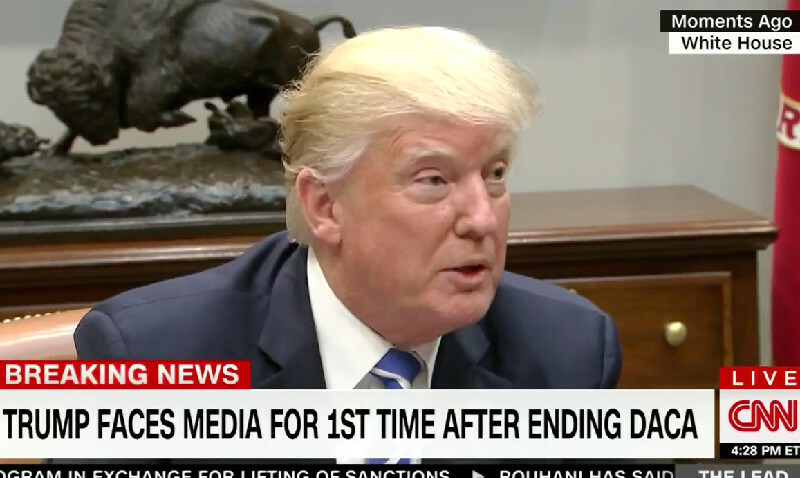 This is not even a matter of serious dispute, unless you are a member of his “Cult 45.” Heck, in the previous election cycle he strongly supported DACA, and even after his announcement Tuesday he claimed to have “great love” for the co-called DREAMers it protects. What is really amazing, and probably more important than the issue itself (which, since DREAMers are never going to be deported, is, in my view, overrated), is just how pathetically Trump seems to be playing the political game here. For a guy who became famous for The Art of the Deal, he’s negotiating this situation like a naïve first-time home/car buyer. Then there is the bizarre six month delay before DACA is fully ended, supposedly so that Congress can act and fix the problem (as if THAT has ever happened before on a controversial issue). This makes no sense. If Trump really wants the program disbanded (he doesn’t) then why does he want Congress to come up with a way to keep it going? Even worse, if Trump thinks it was bad for DACA to be created by the force of presidential edict, why in the world would he want to exist, far more forcefully, by the force of actual law? I get that there is a Constitutional principle at stake here, but those are hardly high on Trump’s priority list and even some of his biggest fans on the immigration issue are worried about the likely impact here. Trump fans are arguing that this is actually a brilliant chess move because it means that he will be able to get something, like funding for his cherished wall, in exchange for DACA becoming the law of the land. However, this highly optimistic calculus is missing important pieces in its equation. Democrats will never vote for wall funding in exchange for DACA because they will feel no pressure to do so. They have no fear of being blamed if DACA is disbanded and, frankly, such an outcome would help gin up their base at the start of a mid-term election. As for Republicans, those who are most strongly for the wall are also the most against DACA. How is Trump going to get them to go along with this plan which is way better, in theory, for Trump than it is for them? Other Republicans are against the wall project on principle, so holding their slim majority together would seem tougher than scaling the big beautiful wall of Trump’s campaign fantasies. But there is another problem with Trump’s “plan” here. It presumes that, at the very least, that Congress will feel the urgency to act so that 800,000 DREAMers aren’t left out in the cold (again, they won’t be, even if DACA really is ended). Trump has already effectively cut off whatever leverage he may have had, however, by tweeting that he will “revisit” DACA if Congress doesn’t act. He is clearly bluffing and everyone not in his cult knows it. – Congress does nothing, and Trump says “never mind” (at best, an embarrassing draw). – Congress does nothing and Trump, out of ego, ends DACA in an election year (Democrats win). – Congress passes something very liberal and Trump vetoes, but keeps DACA (Democrats win). – Congress passes something very liberal and Trump signs DACA into law (Democrats win). Can someone please explain to me how Trump got elected president of the United States claiming to be a master negotiator and strategist who was going to fix our illegal immigration problem?